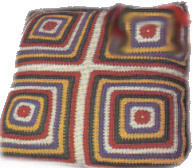 The squares are decorative and can be crocheted in any color to match any home decor. It’s vintage, but perfect for any modern home. You will need a worsted weight yarn, an F crochet hook and a 36 by 36 inch pillow. If you enjoyed this free crochet pattern you might also enjoy more free designs by Craftbits.com.